The issue of “dollars to the classroom” has been a topic for years, with critics charging that not enough education spending is reaching the classroom or students. The issue is back again in this fall’s election campaign for Governor. In various statements, Republican gubernatorial candidate Kris Kobach has said he will push for requirement that 75 percent of school funding to be spent in the classroom. What would that mean for Kansas schools? KASB has always maintained that school spending has impact on the classroom, and at least 75 percent of current spending directly supports student and teachers. What would change under Secretary Kobach’s proposal depends on two other questions: What is meant by “the classroom?” And, 75 percent of what? Aside from the fact this law has never been a binding requirement on individual districts, there are two big questions. First, that “or” suggests that “in the classroom” OR “for instruction” are two different things. If they are identical, why list both? But because “in the classroom” is not defined, the only thing that can be measured is “instruction,” which is defined using federal government school accounting guidelines for all states and school districts. This definition of instruction includes spending on all teachers, aides and paraprofessionals, coaches, and materials and supplies directly dealing with the interactions of teachers and students, including co-curricular activities. But the definition of instruction excludes all “student support” programs such as counseling, heath, social workers and special education services not provided by classroom teachers (such as speech pathology); libraries, media centers, technology support or professional development; transportation and food services; building operations (utilities, safety, maintenance, insurance), building construction, and all school or district administration, leadership and central support services. In other words, if “in the classroom” only means “instruction,” all of those other activities are excluded. But all of those have an impact on students, teachers and learning. 65 percent – of what? The second big question is that the law does not define “moneys appropriated, distributed or otherwise provided by the state to school districts.” As a result, it is unclear what funding this “goal” should apply to. There are at least three choices. First, does it refer to all school district expenditures? When some say that only about half of school funding “gets to the classroom,” they are using the most expansive definition of expenditures under the law, and the narrowest definition of “classroom.” But considering all expenditures, includes federal funding not provided by the state, local tax revenues raised by school boards or approved by local voters, and non-tax revenues like student fees. Second, does it refer to state aid? That seems to be the clear meaning of money “provided by the state.” But it can be argued that all local money is, in effect, provided by the state by authorizing local funding. However, many state funds cannot be spent on instruction, as will be explained later. Third, does it refer only to “current” funding or “operating” dollars? 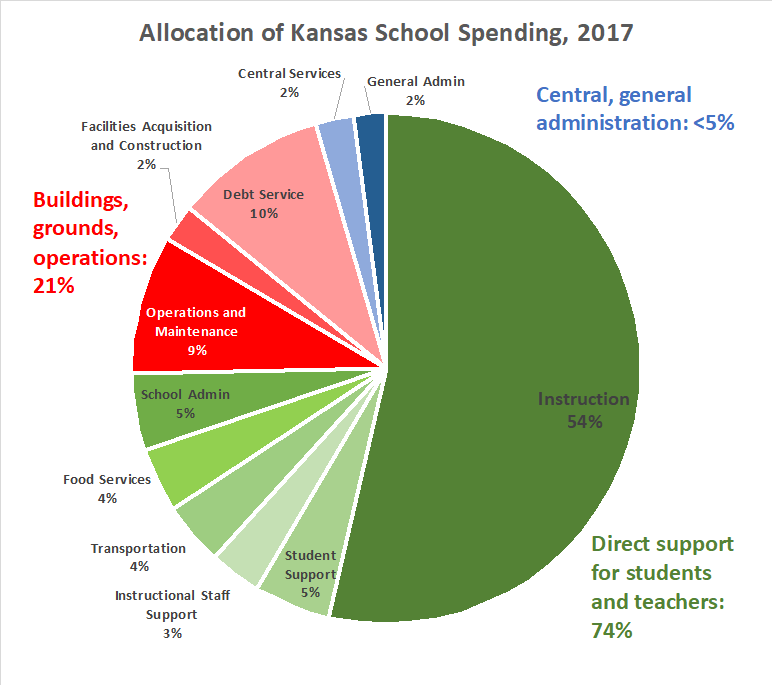 The Kansas State Department of Education reports the percent operating budgets by function, which makes some sense because it would exclude “capital costs” like debt service and building construction that vary significantly among districts for reasons like enrollment growth, and age of buildings. But that is not clear from the law. How are districts currently using their funding, and how do we know? Federal and state accountability guidelines require school districts to report expenditures in several major categories called “functions” which are based on the various activities districts are required to do. The chart and table below contain these functions, the percent of all expenditures each function makes up and the total dollars spent in 2017, the last year data is available. Those functions most directly involved with students and teachers (instruction, student and instructional support, transportation, food service and school administration) account for 74.2 percent of total expenditures. Functions associated with building and operating school facilities (operations and maintenance, facilities acquisition and construction, and debt service) account for 20.8 percent, and central office and general administration account for 4.5 percent. Bond issues. Passing a bond issue for school construction or improvement due to growth or building replacement automatically raises the percent of funding for debt service and reduce for instructional and everything else, regardless of how the district allocates operating funds. Maintenance. Older, less energy-efficient buildings may cause higher utility and maintenance costs. Transportation. Districts with low pupil population density will likely have higher transportation costs, as will districts that transport more children for reasons of safety and other considerations. Support services. Districts with more special needs students, such as high poverty rates, may need to spend more on social workers, resource officers, and special education. Food service. High-poverty schools may have more students eating meals at school or choose to subsidize meals to keep costs lower for families. District size. In small districts, a single superintendent or principal may “do it all,” so general and school administrative expenditures are higher but other costs are lower. Each district’s budget at a glance document, available for all districts here. 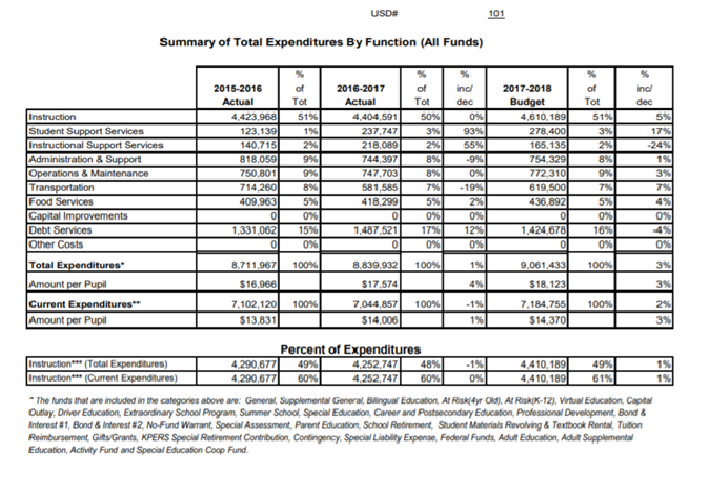 On page 2 is summary of total expenditures by function. For example, below the summary for Erie USD 101 for last year. On page 2 is summary of total expenditures by function. For example, below the summary for Erie USD 101 for last year. How much money could be shifted to “the classroom,” (however defined) and how much could not? Unless districts defaulted on debt, they would not be able to shift $589.7 in debt service payments. Except for a limited amount of transfers from other funds, most of $248 million in food services spending could not be shifted because it is paid for by federal funds and student fees. By law, districts must provide transportation services for students living more than 2.5 miles from school (over $100 million) and special education students and teachers ($68 million). There are at least $45 million in federal funds earmarked for non-instructional programs like teacher professional development. Districts provide $80 million from special education funds and $28 million in special education cooperative funds in student support services (not instruction) based on student individual education plans. These areas account of over $1.1 billion, or 19 percent of total expenditures, and do not include the fact that most of $141 million in facilities acquisition and construction is funded by capital outlay revenue that could only be used for limited instructional purposes without a change in state law. What would be required to reach 75 percent of funding to instruction only? If a state law was approved that required 75 percent of school funding to be spent in the classroom and the law did not include student support programs, transportation costs and the cost of school buildings, then school districts statewide would have to shift $1.3 billion from other budgets areas. If school districts could somehow eliminate ALL central office, district leadership and superintendent costs, which would be impossible both legally (districts are required to have superintendents, board clerks and treasurers) and practically (organizations cannot function without paying staff and other bills, for example), they would still need to shift more than $1 billion from the remaining $1.4 billion in all other available areas to comply with spending 75 percent of funds on instruction. If it were somehow possible to reduce building operation and maintenance cost from $532 to $400 million by extensive school closing (which would certainly increase transportation costs), all other student support, instructional support and student transportation not required by law and school principal and school office costs would have to be completely eliminated. How does Kansas compare with other states? First, the most recent national data available (2016), Kansas ranks 30th among all states in revenue provided per K-12 pupil from all sources (state, local and federal), spending less than the U.S. average, the highest achieving states, and “peer states” most like Kansas. Kansas ranks quite low in the percent of total revenue going to current operating expenditures (47th). A major reason is that the state of Kansas and federal funding largely control how much districts can spend on operating budgets, but districts have not been limited on how much can be approved for local bond issues, which are not part of operating budgets. There is also a mill levy limit on capital outlay funding, but not a spending limit. As a result, school district capital funding, which is mostly determined by local voters, has grown much faster than operating budgets, which is mostly controlled by the state. These capital funds can’t be switched to operating purposes (including instruction). 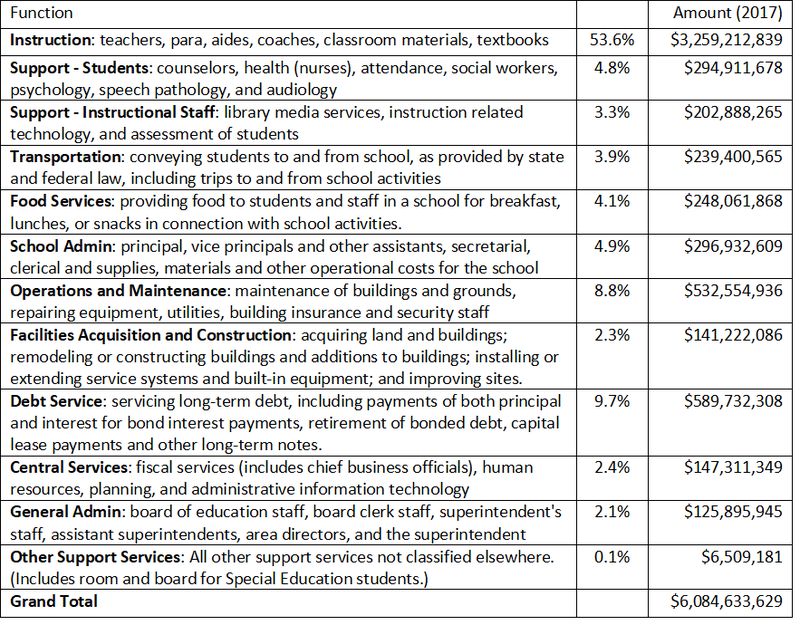 However, Kansas ranks much higher (18th) in the percent of current operating funds going to instruction (60.9%). That is a higher percentage than the U.S. average (59.5%), adjacent states (59.3%) or peer states (59.8%). The Kansas percentage of current expenditures for instruction is slightly lower (0.4%) than the average for the nine top achieving states based on multiple student outcomes, but those states all provide a much higher total revenue per pupil (over $5,000 more). The percentage of funding going to instruction compared to other states is likely to rise in 2018 and 2019 because of increased operating aid provided by the Kansas Legislature. What is the current state law? Here is a link to the full statute.